Super Seven is one of the oldest slots available in the history of casino slots. It is developed by Merkur, which excels in making advanced casino machines and multi-games. It is a fruit machine slot coming with 5 reels and an equal number of pay lines. Super Seven slots are very simple in structure. There are absolutely no efforts taken to enhance its features either in the graphics or in the sounds department. The slot is against a simple blue colored background with various fruits transferred from the dining table to the slot table. Match any 3 of the symbols together and you are up for a win. 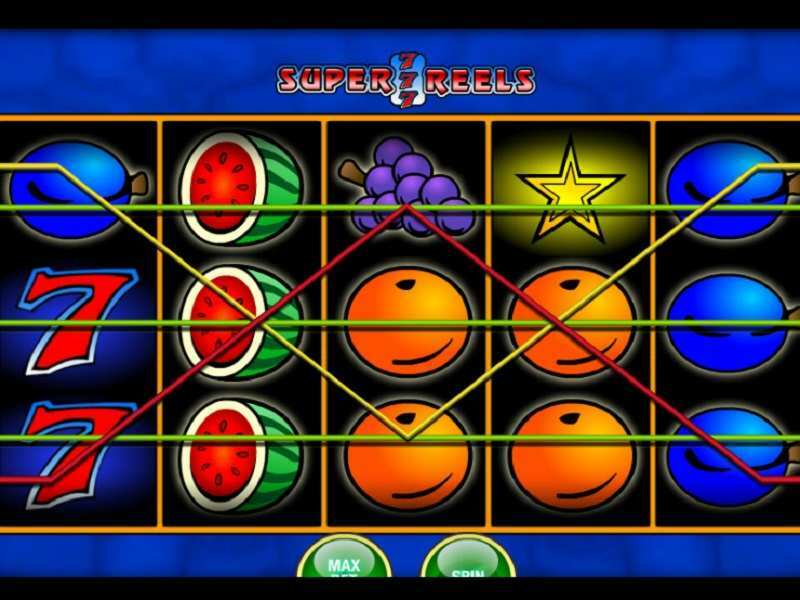 The slot is a classic fruit machine slot so you come across different juicy fruits like a bunch of grapes, cherries, a cut water melon, oranges, plums, etc. All these icons can pay in any direction – left to right or right to left or even in the middle. The video slot game has only a scatter, in the form of the star symbol. The shining star pays out in any position on the reels. Card Gamble: It is represented by the Gamble button marked by a card icon. The bet is on the color of the next card. If you are correct, the winning amount is doubled. Ladder Gamble: It is shown as the Gamble button marked by the ladder icon. You will be shown a ladder with different values. There is a flashing light on them, one after the other. One of the values is higher and the other one is lower than your present win amount. If you manage to stop the light on the higher numbered value, you can step up your win amount. Wild: There is no wild in the Super Seven slot. Scatter: This is the scatter. The shining star pays out in any position on the reels. The Star symbol can win as per its position on the reels and only the number of the star icons amount to the wins. Watermelon and Bunch of Grapes: These juicy fruits give away 10 coins for spotting 5 of the icons together. Number 7: This is a top paying symbol of the game. It gives 100 coins for getting 5 of them in a row. Cherries: These small fruits give 3 coins for 5 of a kind. The minimum betting that you can place is 0.05 and maximum bet is 10 (any currency equivalent, in this case Dollars and Euros). The RTP is quite good at 96.12%. You can play free Super Seven casino slot machine, with no download or sign up requirements. You are free to invest real money too to play this slot machine at some of the best sites in UK. The Super Seven online version can be played directly on your desktop or mobile. Though the online game lacks in style and fails to compete with its contemporary slots, it offers a number of payout options, fair odds with an equally easy to understand game play. Without wilds and bonus features, the game offers the energy boost that is needed to your bank roll. 0 responses to "Super Seven Slot"